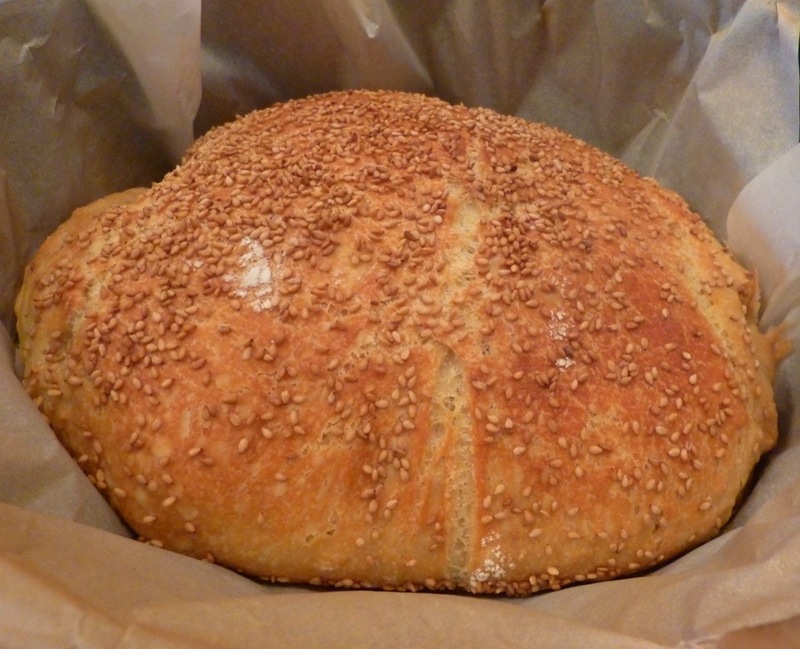 My absolute favorite artisanal loaf is sesame semolina bread. We had it often growing up. My mother didn’t bake it herself, since there were plenty of good local bakeries from which to purchase the crunchy delicious loaves. 20 years ago, when I went to the little village in Sicily’s interior that my mother’s family comes from, my relatives showed me how to make semolina bread from durum wheat they had raised and milled themselves. They stored the wheat in big burlap bags in the basement, alongside the young chickens, aging cheese, and freshly-pressed extra virgin olive oil. Cousin Giuseppa never measured anything and made the most delicious bread I have ever tasted. I wrote down the recipe as my cousin added ingredients and kneaded the dough, but I could never get the flavor right. I assumed it had to do with freshness of the local flour. I have tried over the years to come close to the flavor in my own kitchen without success. I recently purchased locally grown semolina flour and durum flour and have been making bread almost daily in an attempt to make a decent loaf. This recipe is an adaptation of Jim Lahey’s ‘No Knead Bread.’ It works well and the crust is delicious. I mix everything in a food grade plastic bucket, which takes less than 5 minutes, then tap the lid on and let it sit at room temperature for 16 hours. Lahey’s recipe suggests anywhere from 12-18 hours for the first rise. If you don’t have a bucket, use a ceramic or glass bowl wrapped tightly with plastic wrap. Mix the flours, salt, and yeast in a bucket or bowl. Add water and stir until you get a smooth, shaggy batter. If it is dry add more water (1/4-1/2 cup) Place lid on or tightly wrapped plastic wrap and let sit out at room temperature for 16 hours. Scrape dough onto a well-floured surface. Add a few tablespoons to 1/4 cup flour onto dough, enough to be able to handle it and turn over a few times. Shape into a ball. Cover with a tea towel. Let rise about 2 hours. After the first hour and a half take a 5 quart cast iron Dutch oven with a lid and place it in a cold oven. Turn oven to 450 degrees and let it preheat for 30-40 minutes. Take preheated Dutch oven out of the oven and place a large piece of parchment inside the pot. Pour dough onto parchment. Sprinkle with enough sesame seeds to cover the top of the dough. Place lid on pot and return to the oven and bake 30 minutes. Remove lid and let bread continue baking for 20-30 minutes longer until dark golden. Remove pot from oven and take out bread by lifting the parchment paper. Remove paper around bread and let cool on rack until cool enough to handle. Makes 1 loaf. Note: An update to this recipe in 2018. If you cannot find durum flour, use 1-1/2 cups all purpose flour and 1-1/2 cups semolina flour, finely ground in a food processor. Living at high altitude in a dry place, I find this formula to give more consistent results with half semolina and half regular flour. Add to the flour: 1-3/4 teaspoons fine salt, 1/2 teaspoon yeast, 1 tablespoon sugar helps the rise along with 2-1/4-2-1/2 cups water. For the second rise add 1 to 1-1/2 cups of flour rather than 1/4 cup as in the above recipe. You want to add enough flour so that the dough is glossy and sticky, but holds its shape. Pour into an oiled preheated Cast Iron Dutch oven. Sprinkle generously with toasted sesame seeds. Bake at 450 degrees for 30 minutes with a cover, 15 minutes without a cover. I own two Dutch ovens which both can fit in the oven at the same time so I usually put together two batches of dough. One loaf disappears so quickly, it makes sense to have two loaves for the same amount of work. Judy, this is beautiful! I’m so glad Rex told me about your blog! Thank you Natalie. I look at your blog regularly. You have some great recipes. If you are interested in making this bread I have plenty of semolina and durum flour. I would be happy to run some over to you. I’m a little bit offline lately, so sorry for taking so long to get back, but I would LOVE some semolina and durum! Thank you, thank you! Jack, thanks for commenting. I am glad it turned out well. Bread baking is a great snow day activity. I pretty much a novice bread baker. I have not used durum or semolina flour before, and the terminology seems confused and confusing. I want to try your recipe… It sounds & looks great… but I’m not sure exactly what flours to buy. Can you offer some advice? I’ve been trying out the dutch oven method with various dough mixtures and have been amazed at the simplicity and great results. Thanks! Give the whole grain durum flour a try and see how you like it. It is fun to experiment with different flours and proportions. Let me know how it turns out. Hi Judy! I haven’t met you yet. I work with your son, Joe. He shared your blog with me. Joe made this bread and brought it to work to share with us yesterday. It was absolutely fantastic. I just love the texture! I am excited to try this recipe today and bake it in the Dutch Oven tomorrow! I made it using your slight variation suggestion. Before we left to go camping, I shaped it and placed it in a 91/2” stoneware bowl inside our 12” Dutch oven. I let it rise for two hours while we set up camp. I baked it using briquettes, so I used a formula to calculate how many briquettes I’d need to bring temperatures up to 450°. We used 32 briquettes. 8 on bottom and 24 on top. We let it bake for 45 minutes. It turned out perfect! This will be a recipe I use regularly. Thanks so much for sharing!